Technology has seen transformations since the late 1600s, which started with mechanical powered steam engines followed by assembly line transformation brought in by Henry Ford and Edison and then came the world of microprocessors. Now we are in Technology 4.0, the most profound one, and Nasscom’s 5th Annual Technology Conference (NATC 2018) is all about it. NATC 2018 is being held in Gurugram on 26-27th September. The conference will focus on progressive topics including Cyber Physical systems, IoT, and all forms of computing including Cloud, Fog, Edge, Mist and Cognitive Computing. Every year, NATC brings together speakers from all over the country to share their knowledge and experiences amongst the upcoming talent that are looking forward to the transformation in them and for their organizations. Sriram Sitaraman, Practice Head - Analytics and Data Science at Srijan, has been invited to speak at NATC 2018. 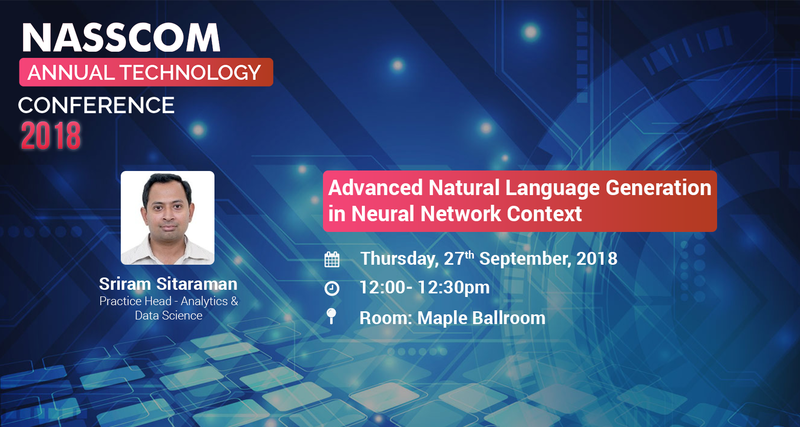 Sriram will share his extensive experience on advanced NLG and how it is gaining traction and relatively more adoption in recent years. Advanced NLG holds the maximum business value as it produces meaningful interpretation of structured and unstructured data and distinguishes its most important and interesting part. The most well-known subsets of Artificial Intelligence (AI) are Robotic Process Automation (RPA) to automate repetitive tasks by giving the ability to the systems to learn and improve work processes, and natural language processing (NLP) to enable machines to understand humans’ way of writing or talking. A lesser-known subset is Natural Language Generation (NLG). Ever wondered how a virtual assistant responds when asked a question? Answer to it is NLG. It’s a process that can generate natural language text and speech from predefined data. Other speakers at the conference include Cynthia Stoddard, Global CIO at Adobe, Deep Kalra, founder and CEO of MakeMyTrip and Shailesh Kumar, Chief Data Scientist at Reliance Jio, to name a few. Sriram has over 20 years of experience in designing and delivering innovative business solutions. He leverages his expertise in machine learning, statistical modelling, and business intelligence to enable digital transformation in industries as diverse as healthcare, manufacturing, retail, banking and more. Sriram is Practice Head for Analytics and Data Science at Srijan Technologies. He is currently working on a couple of projects for Fortune 500 companies where he is playing an instrumental role in AI & ML adoption on a large scale. The National Association of Software and Services Companies (NASSCOM) is a non-profit trade association of Indian Information Technology and Business Process Outsourcing industry. NASSCOM has over 1500 IT services companies as members, of which over 250 are companies from the United States, UK, EU, Japan and China and are in the business of software development, software services, software products, IT-enabled services and e-commerce. The NATC is a conference for technologists and technocrats and agenda of organizing it is to facilitate a common platform for top decision makers to discuss the current trends and encourage innovations. An introduction to OWASP Zed Attack Proxy, how it works, and how to configure and start using it. How to Display a Custom Form Mode in Drupal 8 ? All trademarks, trade names, service marks and logos referenced here belong to their respective companies. Copyright 2018 Srijan Technologies Private Limited.